The Sweet Bookshelf: Why Give Books This Christmas? It is not news that the economy is rubbish right now. No matter where in the world you are. Christmas gifts are getting harder and harder to buy each year. This got me thinking about what are the best gifts to give. It is no surprise I would say a book. But why? I'll start off with the obvious first. You can buy a book for under £10 (or $10). Many book stores have deals where you can buy 2 and get one free. What's not to like about that? It is affordable. When you give a book you are saying, "I've taken the time to think about what you'd like." Or sharing a book that you enjoyed says,"I loved this book so much I want you to have it so we will have more we share together." It also says,"I'm giving you a gift you can re-open again and again." Giving a sweater doesn't convey that message. When you go to buy a book you are actually forced to think of the recipient. What are their likes and dislikes? You are picking something personal. Reading a book offers the chance to get away from it all. That's why I read! I want to use my imagination and have a little bit of peace and quiet in this hectic world. 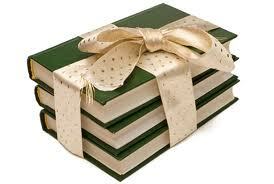 Giving a book offers that to those you love. I know not everyone is a reader, but giving a book is an invitation. So give a book this Christmas! There is a list of my favorite books on my sidebar. If you'd like some personal help recommending a book for your loved one, please email and I'll be so happy to help! Way to go Jolene! I wouldn't expect any less from an author! I think it's the perfect gift! I'm glad we live in a time when reading is cool. Thanks to JK Rowling for that! !